Our heavy thickness stock feeler gauges are available in 1/2" wide by 12" long blades. We only use high quality spring tempered steel. This material provides stable accuracy and superior wear resistance. 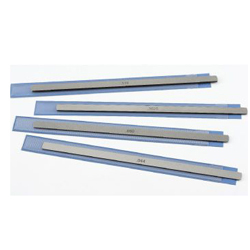 Each blade is enclosed in a blue vinyl sleeve with a transparent top so you can see the thickness marking. Our cartons are made of tough polypropylene and are marked with the type of material and thickness. Thickness tolerance for all blades is ±.0005. Standard packaging is 6 blades per carton.